We’d love your help. Let us know what’s wrong with this preview of Dragonfell by Sarah Prineas. From Sarah Prineas, author of The Lost Books: The Scroll of Kings and the acclaimed Magic Thief series, comes a stunning new middle grade fantasy stand-alone novel that pits magic against modernity as factories and industry weaken the once-majestic dragons, whose fate rests in the hands of two independent young heroes. Fly with the dragons in this new middle grade fantasy s From Sarah Prineas, author of The Lost Books: The Scroll of Kings and the acclaimed Magic Thief series, comes a stunning new middle grade fantasy stand-alone novel that pits magic against modernity as factories and industry weaken the once-majestic dragons, whose fate rests in the hands of two independent young heroes. Fly with the dragons in this new middle grade fantasy stand-alone novel from Sarah Prineas, author of the acclaimed Magic Thief series, where the fate of these once-majestic beasts rests in the hands of two independent young heroes. To ask other readers questions about Dragonfell, please sign up. E-arc provided by Edelweiss and HarperCollins. Thank you so much! So, I'm a thirty-something woman who, now and again, loves her some MG fiction. Soooo, when I saw this listed, read the synopsis and got a good look at that cover, I knew I had to read it. I've been in a dragon mood lately, and this one satisfied my craving. This story follows Rafi, who is different than other kids with his dark eyes and flaming red hair. When shifty things start happening to neighboring villages, some strange peop E-arc provided by Edelweiss and HarperCollins. Thank you so much! This story follows Rafi, who is different than other kids with his dark eyes and flaming red hair. When shifty things start happening to neighboring villages, some strange people come to Dragonfell to question Rafi and his father. The strangers accuse Rafi of being dragon-touched and seek to take his "power" from him ultimately. Rafi's ability to not feel the cold or be able to touch hot coals attract more than baddies. On his hero's journey to find out who he is and the secret about dragons, he meets a girl named Maud, who aids him. But there is more to her as there is to Rafi, so we've got some secrets bouncing around to keep us on our toes. I received this book as an ARC from the publisher and absolutely loved it!! Such a unique and fun read! Very age appropriate as a middle school novel. Epic adventure with dragons galore!! Rafi has always been a little different, but he and his father scratch out an existence in their small village, where his father weaves cloth. When two suspicious looking characters, Gringolet and Stubb show up at their door and talk about cottages in a neighboring village being set on fire, Rafi treats it as a threat. His angers flares... and Stubb is badly burned. This brings a visit from Mr. Flitch, the owner of the biggest factory in Skarth, who claims that Rafi is "dragon touched" and must come with him for his own safety. When Rafi refuses, Flitch threatens to exact revenge on the people of the village, so Rafi runs away. It's true that Rafi looks a bit wild, and doesn't feel heat or cold like most people do, but he's still surprised when his father tells him of an event that happened when Rafi was small. A dragon called him up to the Dragonfell, and breathed fire on Rafi's father when he tried to take Rafi away. When Rafi meets the quirky Maud on his travels, she is not worried about his differences, and the two (along with an ever growing number of goats) make their way to Skarth. They steal a book that outlines the whereabouts of the few remaining dragons from Flitch's office in the factory, and end up on the run in a vapormobile from Flitch's minions. They end up at the Ur-Lair, where Rafi is able to communicate with the dragons and find out more about Flitch's evil plans to hurt the dragons and further his factories. Surprising things surface about Maud and Rafi, but in the end, the villagers in Rafi's community decide to try to side with the dragons and eschew the progress that Flitch promises. Strengths: Dragon books have their fans, and this one included some new dragon lore. That dragons all hoard something, but not necessarily the same thing (blue flowered pottery, clocks, books, mittens and knitted things!) was particularly fun. Rafi and Maud have a good working relationship, and the twists concerning their identities were unexpected. The setting is a bit different from most medieval dragon books; I can see how the industrial revolution could have contributed to the extinction of dragons. Prineas's writing is always solid, and this moved along at a brisk pace. Weaknesses: I was confused as to what the essential message was. Dragons are good, but industrialization is bad? Why was Flitch so evil? Couldn't the factories run without the dragons? "It feels like flying." From the first page of this middle grade adventure book the author has us right on the edge of the fell feeling the wind lift us up. For the middle grade child, male or female looking to discover their own unique spark of talent and a place where they belong. This book takes us on a journey of self discovery in a time when Dragons are disappearing and industry is taking over. Highly recommended as a good read. Rafi wonders what happened to the dragon that used to preside over his village until a fire strikes, he is accused of being "dragon-touched," and he sets off on a journey for his own safety while learning what happened to the dragons and what he really is. This somewhat predictable middle grade novel is a good choice for dragon lovers and those seeking a light fantasy. I havered a bit between four and five stars, because I was pretty tense for a lot of the story and so couldn't actually enjoy it as much as I would have liked...but now I know how things work out, that won't be a problem when re-reading! 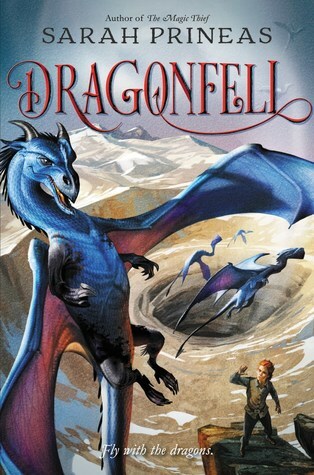 For a kids fiction novel it kept me interested but wished that it would go more in-depth with the dragons. Overall it was an okay read. Interesting look at the effects of the industrial revolution on dragons. Recommended for grades 4 & up.